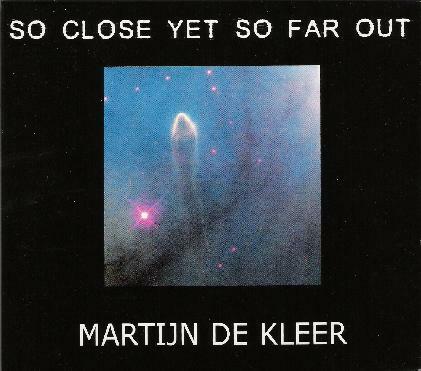 Martijn de Kleer - "So Close Yet So Far Out"
De Kleer's initial solo offering outside the chemical playschool of The Legendary Pink Dots proves to be both close to and yet far away simultaneously from the seminal LPD sound. As the prime mover of the LPD aural soundcraft, one would expect de Kleer's work away from the mothership to possess a similar sonic consistency, though of course without the hallucinogenic vision of Edward Ka-Spel. Surprisingly, de Kleer refuses to take a backseat to Ka-Spel, either lyrically or conceptually, on So Close yet So Far Out. Imaginatively conceived and meticulously recorded, So Close yet So Far Out reveals the depth and profundity of de Kleer's own visions, obsessions and flashbacks. Nods to 60s psychedelia, 70s kraut-rock, 80s industrialism and 90s electronica are all evident in the eight pieces that make up So Close yet So Far Out. And de Kleer's fuzz-driven guitar is at the heart of it all, particularly on the aptly titled "Once upon a Guitar," an acid freak-out worthy of comparisons to Ash Ra Tempel and early Neu. Among the first seven tracks, "You Are…" roils with the submerged psychosis of Barret-era Floyd welded to the manic axe-grinding of Helios Creed, and the same can be said of "Jet Lag," with its organ-driven trancescape literally exploding into space on de Kleer's rocket-fueled guitar. It's a blissful, mind-numbing anthem for psychonauts everywhere. The utterly bizarre and imaginatively titled "What Happened to a Young Man in a Place Where He Turned to Water" is the kind of Zen parable one might expect a cyber acidhead to put to music, or in this case sound decomposed and reconstituted as music. Interstellar feedback from the Orion nebula might be the closest analog with which to compare such decidedly psychedelic fare. But the album's centerpiece is clearly the epic length "The Apple Crumble Trail," a nearly 30 minute voyage through the inner spaces of Eastern-tinged psychedelia to the outer limits of kosmische rock. Evolving out of a primal drone, waves of shimmering organ rise and fall in a mantra of coalescing exotica, from Tibetan chants and natural sounds to metallic percussion and looping bass. Moving through successive cycles of stasis, hypnosis and pathos, "The Apple Crumble Trail" climaxes with de Kleer's mutated guitar soaring raga-like over an ocean of sound, before decelerating into a terrestrial orbit filled with the echoing remnants of what has turned out to be a phantasmagoric astral trip-and all-in-all a thoroughly satisfying one, too. Email at: blrr@blrrecords.com or tijnkleer@hotmail.com.